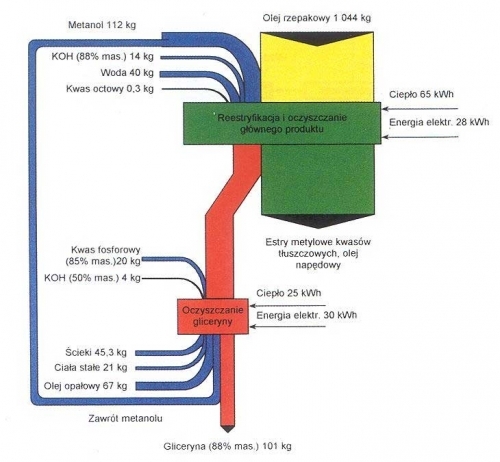 An article on the Polish website ekoenergia.pl titled ‘Rozwój biopaliw – efektywniejsze rolnictwo cz.2’ by Prof. Dr. Włodzimierz Kotowski shows the following Sankey diagram. The process system shown is a re-esterification of rapeseed oil with methanol. Flows are mass flows shown in kilograms. Methanol is shown in blue. It is re-used and fed back into the process. Anyone who speaks Polish who can explain further?